By Salil Mehta, Statistical Ideas. This is a fast look at the current polling of the 2016 general election match-up between Donald Trump and Hillary Clinton. Of course anything can happen between now and Election Day (a state holiday in many parts of the U.S.) to shift these polls further. Just as it is possible that either Ted Cruz or Bernie Sanders, or both, may instead win their respective primaries. There are a handful of regular national canvassers who we looked at here: NBC/Wall Street Journal, MSNBC, USA Today, CNN, Fox news, Rasmussen, Quinnipiac, and PPP. Due to the high resource constraints, this statistical polling does not take place every day, but in recent months we can make out some fundamental current patterns! What we see is that Clinton generally has a 5 percentage point lead over Trump. Say generally speaking that 45% currently prefer Clinton, and 40% prefer Trump. That's not bad for the latter given that until recently he was only a business celebrity, while the former has been scheming a White House rule for decades. But how do we take such seemingly humdrum information to ascertain how tight the odds are for either candidate? Looking at the data just a bit more carefully, it is easy to notice that even as Trump gains in the Republican primaries, there has been a very recent (past several weeks) decline in his favoritism versus Clinton in the general election polls. Meanwhile Americans are increasingly uncertain who they would vote for. 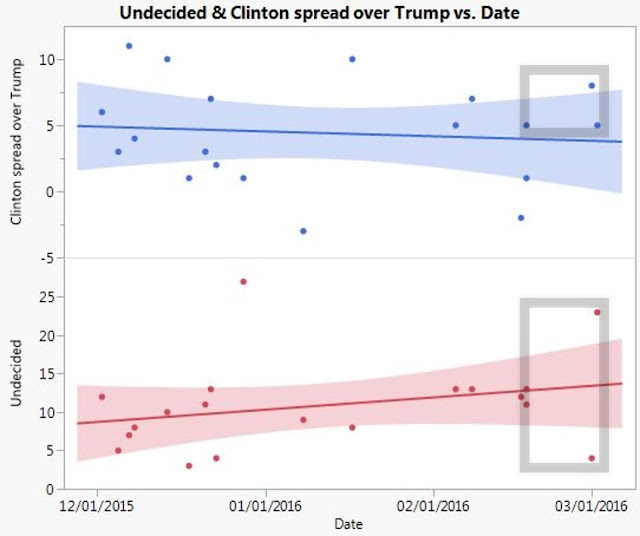 The undecideds' have taken away from estimated votes for both Clinton and Trump, and acutely in the most recent weeks the portion of voters who are undecided has been exceptionally volatile. Still, with the standard error about the general election spread shown (in blue) below, we would expect that there is still a 25%-30% chance that Trump would be elected POTUS. Despite last summer Huffington Post making a sham of one's presumption of unbiased news-"reporting" by subjugating Trump's "side show" coverage to their ludicrous Entertainment section, the probability of his winning is certainly not zero. And in fact it climbs to only a 1 in 3 chance even if most of the surveyed undecideds (in red) eventually vote for him. Despite serious stakes, the outcome is similar to rolling a die with 2 faces painted red (for conservative) and 4 faces pained blue (for liberal): despite the bias, both colors will eventually have a chance to be landed on!